Wet Age-Related Macular Degeneration, wAMD, is a serious eye condition affecting primarily the elderly. Gradual degradation of the macula, the area of the retina that provides our sharpest focused sight, results in the loss of central vision. It also distorts remaining vision. Central vision impairment has a devastating effect on quality of life as it makes driving, reading, general mobility, recognition of colours and faces impossible. Wet AMD is the most common cause of vision loss affecting millions of individuals in North America every year. 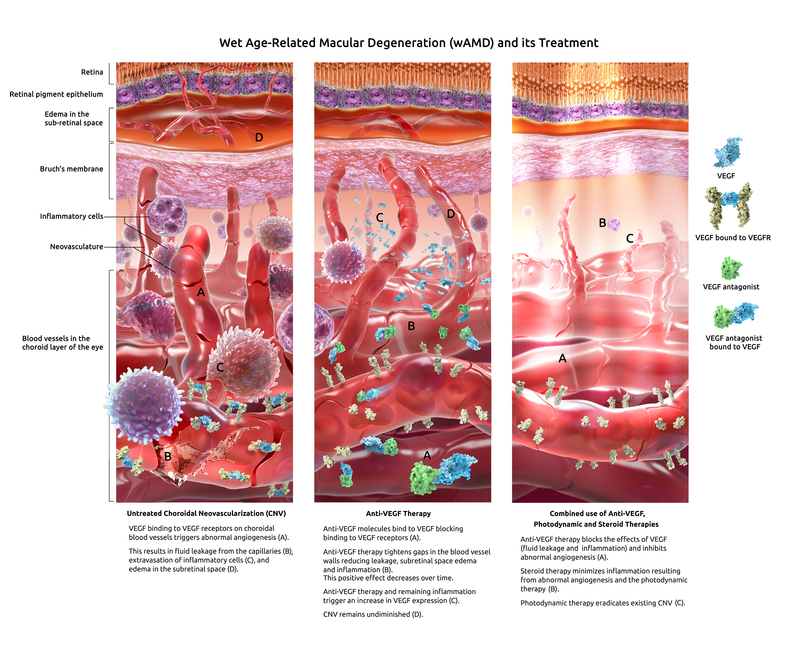 This panel of 3 illustrations by Audra Geras shows the disease state and the changes seen with 3 commonly-used therapies. 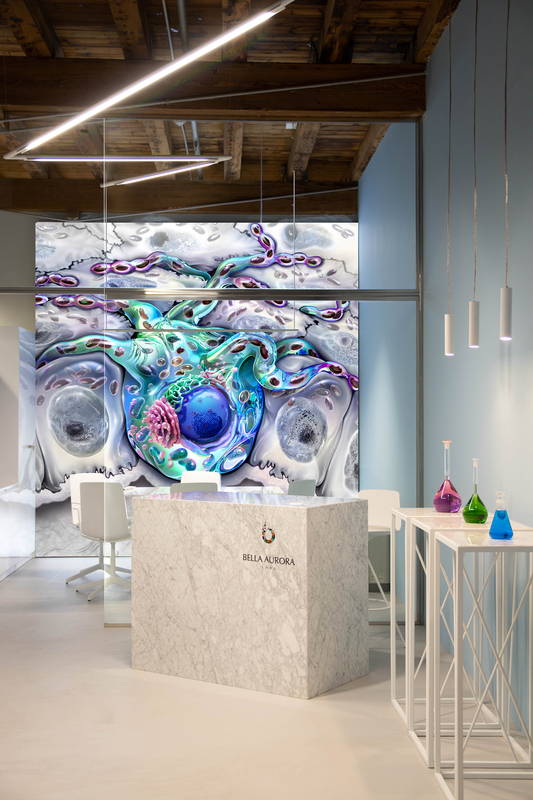 Cosmetics research firm, Bella Aurora Laboratories, in Barcelona, Spain, recently installed one of Audra’s paintings in the meeting room of their newly built research facility. This custom 3D mural of a melanocyte, (the skin cell type that produces skin pigmentation) was printed on fabric and backlit for maximum impact. So exciting to see the integration of Audra’s art in this striking interior! 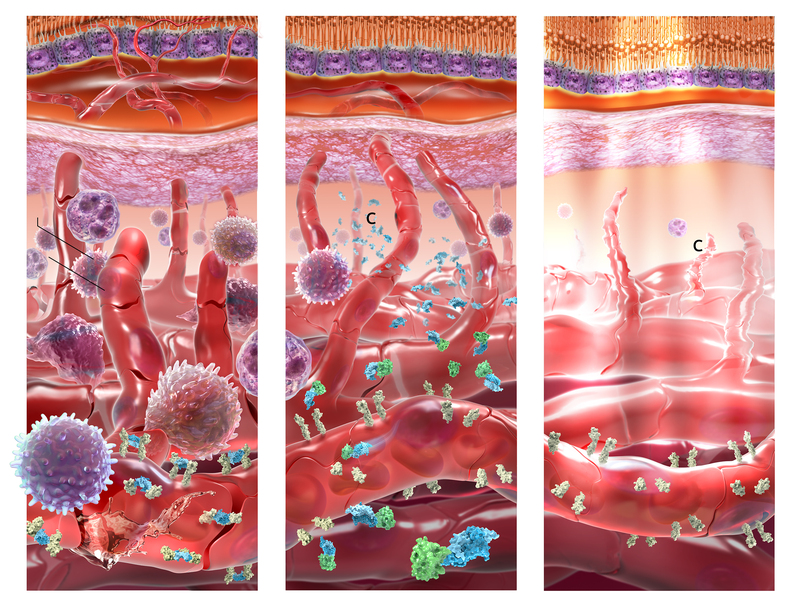 The last illustration we featured depicted tumor cell processing and presentation. This illustration has now become a diptych! 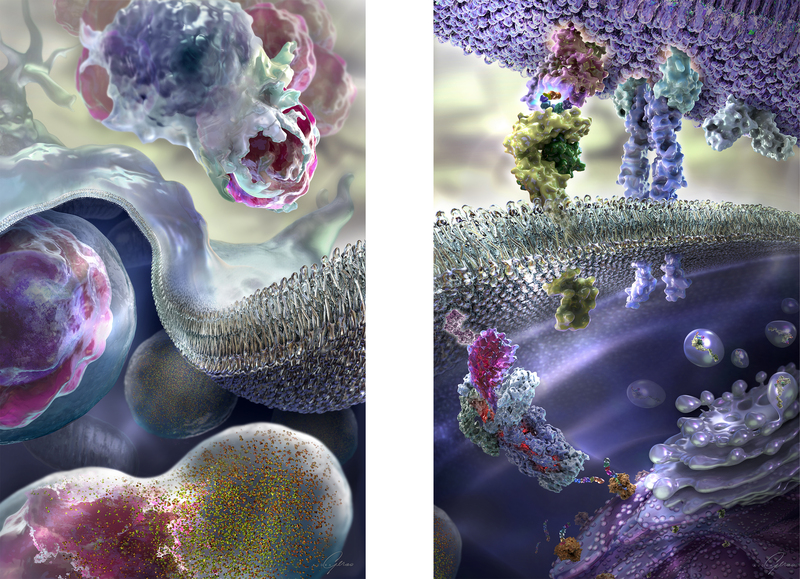 ‘Phagocytosis of Tumor Cells’ is a new 3D painting created by Audra Geras to show the events that preceded antigen processing. Here is a look at this new diptych. The diptych paintings are intended for a variety of uses. These include their exhibition as framed large-scale fine art giclées on canvas that are on permanent exhibit at Trillium Therapeutics Inc.
Is it possible there is a triptych coming soon? Hope you enjoy this recently completed illustration explaining the basic MHC Class I immune process following the phagocytosis of a tumor cell. The story starts following the phagocytosis and degradation of a tumor cell by a dendritic cell. Further degradation of tumor protein by proteasomes creates 8 to 10 amino acid long antigenic peptides. 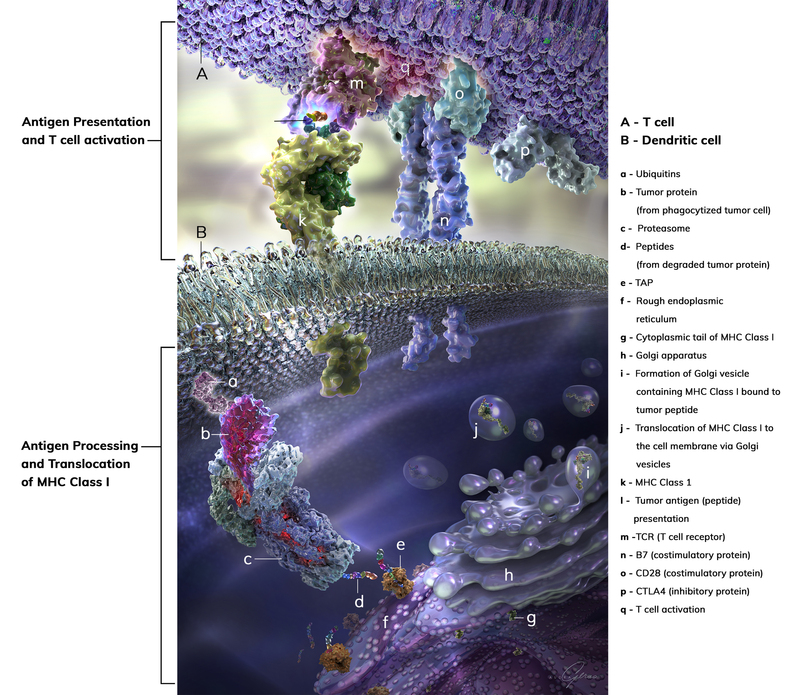 T cells become activated as a result of the presentation of these antigenic peptides by MHC Class I to the T cell receptor (TCR). 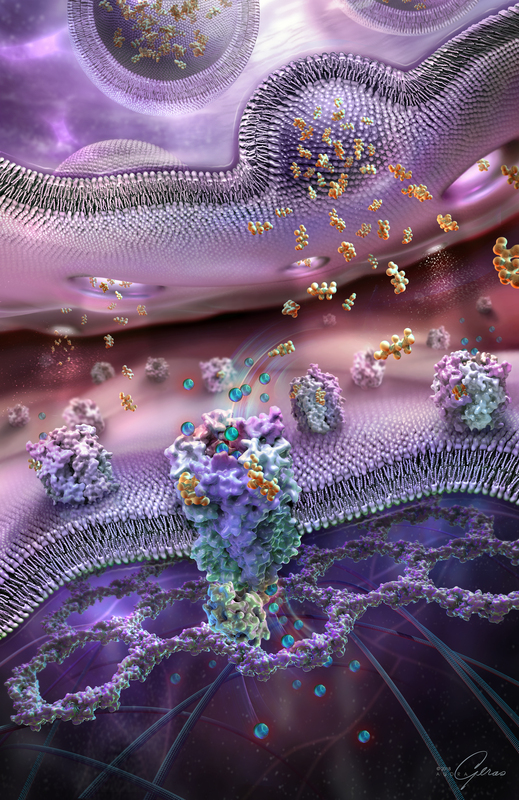 The latest feature illustration is one Audra recently created featuring the release of neurotransmitter, GABA, (y-aminobutyric acid) molecules from presynaptic vesicles into the synaptic gap. 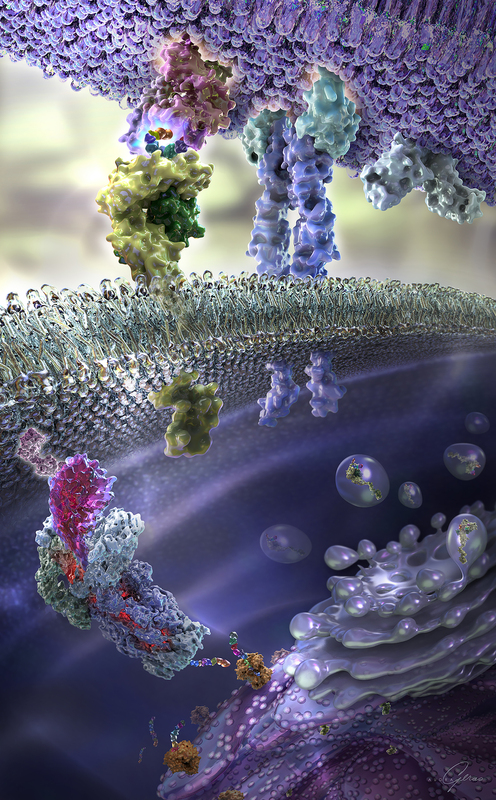 GABA is shown binding to the GABAa receptor pentamer in the postsynaptic membrane, resulting in the opening of the receptor channel. Negatively charged chloride ions flow through the open channel into the postsynaptic neuron causing a hyperpolarization of the postsynaptic bulb. This has as an inhibitory effect on neural transmission by preventing the development of an action potential. The GABARAP molecule, the hexagonal lattice formed by gephyrin molecules and cytoskeletal tubulin dimers are depicted beneath the postsynaptic membrane. They form part of the postsynaptic protein network of inhibitory synapses.